Beaded Pool liners are the most commonly used liners for above ground pools. For a beaded pool liner, a bead receiver is used that runs across the top edge of the pool and the pool liner is simply snapped into the bead receiver ensuring an easy installation process. Beaded pool liners are better than overlapping pool liners because they are easy to install and maintain. The bead receiver ensures wrinkle free fitting of the pool liner along the walls of the pool and there are less chances of damage and unexpected cuts that may appear in other forms of pool liners due to wrinkled and creased liner fitting. 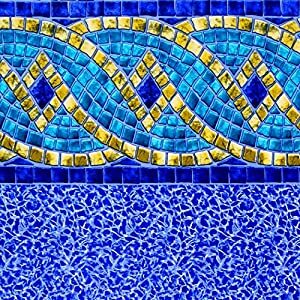 The Riviera pool liner has an adaptable design feature and with a built-in beaded attribute it can be easily adjusted into a typical above ground beaded or a J-Beaded pool. The suppleness in the pool liner allows it to adjust easily into a height of 48’’ pool. The pool liner is manufactured with a high grade vinyl composition which protects it against the strong ultraviolet rays, which are a major cause of damage of above ground pool liners. This pool liner is also resistant towards anti-bacterial pool chemicals and with proper installation and maintenance this pool liner can serve you for as long as 25 years. The Lap Seam Construction pattern provides extra protection against unnecessary damage and breakage due to contact of sharp objects. This pool liner is manufactured with modern seaming patterns which go well with all kinds and shapes of pools. Aesthetics is one of the many major reasons people need a pool liner along with protecting the pool. An above ground pool is no doubt an important place in a house and it’s necessary to maintain and make it look great. A pool having a beautifully designed inner lining would definitely add value to the pool. This Riviera pool liner is no doubt a great one. It gives a full coverage to the pool in a way that creates a natural feel in the pool with stones like and tiles like designs on it. The sharp colors give the pool exciting and refreshing feel. The pool liner has been manufactured to give a heavy duty service for your pool lining needs and can withstand water pressure in a 24 ft ×48”ft pool. It would last and serve for a long period of time without getting wrinkled and fading issues. In order to support this claim the Riviera pool liners come with a 25 years of warranty from the manufacturer. This surety makes the customer feel secure and relaxed if the liner has been bought. It is easily adjustable for large size 48’’ pool walls and the built-in beaded design provides easy installation process which further ensures quick replacement and maintenance routines. The pool liner is composed of standardized vinyl structures and the U.V protection provides an extra shield against the regular wear and tear of the pool liners. So you don’t have to worry about frequent repairing or replacement for your pool lining. Rather, it would last for a long time as guaranteed by the manufacturer. The Lap Seam Construction model is its most favorable feature as pool liners are prone to breakage and holes, but a properly seamed liner will have a strong resistance towards the poking of sharp objects. The liner covers all the sides completely without leaving any flaw on corners and joints. This beaded pool liner can be used with J-Beaded pools as well and bead receiver ensures wrinkle free installation so that the pool liner does not get damaged due to folds and crumples in the liner wall. There are several precautionary measures that you can follow to ensure that your pool liner lasts a lifetime and does not wear out before its warranty period which in this case is 25 years. During the installation process, take special care to ascertain a wrinkle free installation of the pool liner and it should fit properly along the pool walls. The bead receiver should be aligned properly to keep the pool liner intact and in place. If you don’t, you may get a wrinkled finish and that would be a good installation. Be careful to avoid such a situation in order to avoid damages to the liner. It is better to install the pool liner on a sunny day and lay out your pool liner under the warm sun for at least 30 minutes before the installation so that it expands to its maximum length and fits accurately into your pool. This would help you fix the liner evenly and quickly without any problems. Before installing the pool liner, clean your pool by draining out all the water and remove the old liner as well. Put fresh pool sand in your pool and then start the installation process. Beaded pool liners are a little more expensive than overlapping pool liners, however, they are long lasting and durable and the professional installation and usage method makes them all the more valuable and appealing. The Riviera beaded pool liner is certainly a high-demand quality product and serves the purpose of a long lasting, well designed and nicely patterned pool liner to give a perfect finish to your above ground pool.